High Coverage Foundations.. 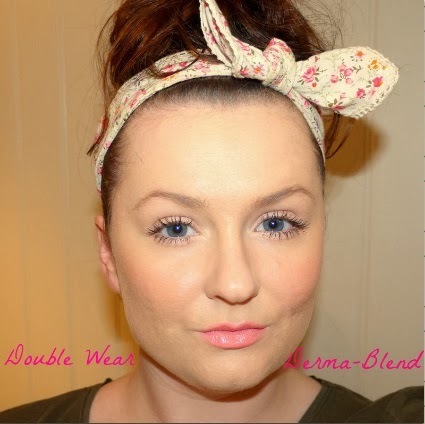 Double Wear VS Derma-Blend.. I think i've tried possibly every foundation out there, too light, too dewy, cakey, not enough coverage, anything sound familiar? These two beauties, the current 'high coverage' foundation favourites have finally graced my face, but what they are like in terms of covering up my acne scarring? For a whole day i wore both of these foundations, Double Wear on one half and Derma-Blend on the other, i wanted to put them to the test literally 'side by side' and see how good they really held up! DW Maximum Coverage - Camouflage Makeup is described as: Soothing, natural-looking, liquid-creme makeup for concealing all skin imperfections, including surgical and acne scars, birthmarks, sun spots and varicose veins. DW Maximum coverage is a higher coverage foundation to its predecessor the 'original' double wear foundation, as you can see from the photo it is VERY high coverage, it literally covers my tattoo completely in one application so you can see how well it will work on scars etc, this is an absolutely lovely foundation to wear, considering im usually someone who hates 'heavy coverage' foundations because of the consistency and thickness to them, this is absolutely nothing like that, it actually feels really light on the skin, as you need hardly any of the product for it actually to work, so it doesn't leave you with that cakey feeling, and you dont look like you actually have a ton of product on your face for it to actually be covering anything. DB Cosmetique Corrective is described as: a range of camouflage coverage product for irregular skin tone, redness, minor acne scars, enlarged pores, dark circles and pigmentation disorders. DB is not as heavy coverage as the DW, i mean it is very high in terms of coverage but with a lighter consistency meaning it is easier to sheer out than DW, if you prefer a sheer finish with good coverage than this is definitely the one out of the two for you, i thought this wouldve been my favourite out of them both but actually i suprisingly prefer the DW just because the coverage and feel is second to none, dont get me wrong this foundation looks beautiful on the skin and in the photos you cant really tell much difference, but after wearing them side by side for a whole day this one just didnt stand up compared to the DW. Close up of my skin wearing both the foundations, you can see how well they cover any scarring, i know you can see my pores and dipping in the skin from having previous acne but my whole reasons for trying these out was solely to see the coverage and not filling pores etc (although both do a very good job at those). Overall i do absolutely love the coverage they both give but if i had to choose one of these to use as a foundation to really cover up scarring and a multitude of sins i would hands down choose Double Wear, it lasted on my skin for the whole day without budging, smearing or looking cakey, my skin looks, in my opinion 'healthy' and awakend, dont get me wrong the Derma-Blend did match pretty on par, but there just was too many good things i could say about the DW that made it stand out as a winner for me. If your looking for a high coverage foundation then i would 100% recommend trying these out as there are two price points there you can choose from so you dont have to spend an absolute fortune if you dont want to, they are both fantastic foundations and i would say they are worth there weight in gold if youve been searching for a the 'miracle' product that finally covers up everything youve been trying to hide for years, from acne scars to rosacea and post surgery bruising, these will be without a doubt your holy grail foundation for a life time.. I hope you enjoyed this post as much as i enjoyed testing it out and writing up. I'm feeling the urge to try out the DW now! I love Estee Lauder lipsticks and am looking for a good foundation... Might just be the perfect time! This is such a helpful post fir me.. I have so many acne sacrs and need a full conerafe long lasting foundation.. I am going to buy double wear..
Hi frankie, they both look great! I'm about to purchase the double wear max cover the assistant in the shop I went to was wonderful and was with me for 45 mins showing me the best way to cover acne. What colour dw are you wearing? She put it over my whole face and I left the shop looking so much better! This is a really great comparative review! Although in general I'm not a fan of full cover foundations for during the day as I find them uncomfortable to wear, I recently purchased DW for nights out and I'm really liking it! It doesn't budge! Amazing review, will definitely be recommending this to my friends with scarring! Your skin looks amazing. Doublewear is waterproof and comes in more shades. 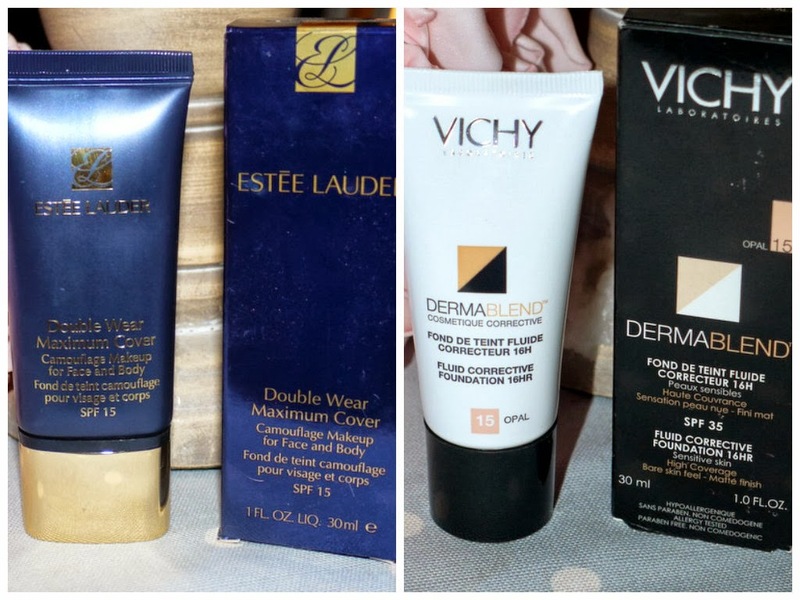 I use to work for Estee Lauder and it was the heaviest coverage of all of the foundations (ie. Doublewear Maximum Cover). What primer do you use with your foundation?